As we enter the month of September and start planning for 2019, it’s a good time to take stock of where Drupal is as a project and see where it’s headed next year and beyond. Dries Buytaert, founder of Drupal, recently wrote his thoughts around the timeline for Drupal 9 and “end of life” for Drupal 7 and 8. We will look at current Drupal 8 adoption and assess where we sit in 2019 as well. Finally, we will wrap up with thoughts on what these changes mean for both developers and organizations that use Drupal today or evaluating Drupal. As mentioned previously, Dries has offered his thoughts on the proposed timeline for Drupal 9 in a recent blog entry on his website (see below). In early September Drupal 8 released version 8.6.0 which included major improvements to the layout system, new media features, and better migration support. This is in addition to many other improvements that have been released since Drupal 8.0 was first unveiled in late 2015. In terms of adoption, Drupal has picked up steam with 51% growth from April 2017 to April 2018. 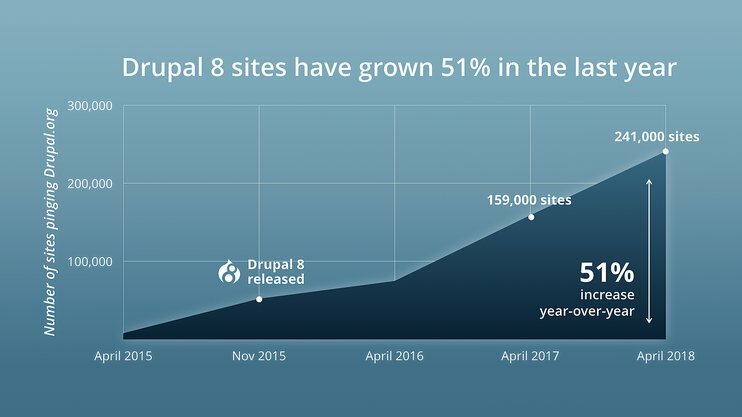 As encouraging is that news is, it’s still should be noted that Drupal 7’s popularity still far exceeds Drupal 8 both in current usage (800k compared to 210k+ sites) and in terms of growth year over year. 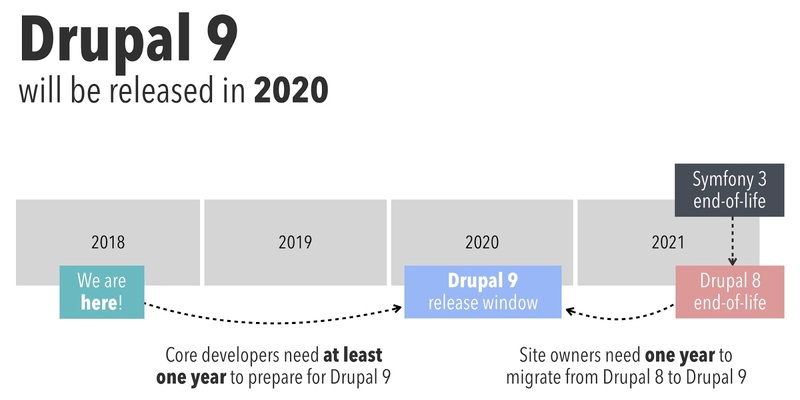 Drupal 7 will reach its end of life likely around November 2021 with paid support extending the lifetime with commercial support (as was the case with Drupal 6). Will Drupal 8 reach the level of usage and popularity D7 has? Perhaps not but that is largely due to focus on more robust, “enterprise” level features. Drupal as a CMS sits largely in between Wordpress and enterprise proprietary CMSs like Adobe CMS and Sitecore in the marketplace. With the release of Drupal 8, the project moved more into the direction of enterprise features (which could explain some of the fall-off in adoption). Pantheon had two excellent presentations (also at Drupalcon Nashville) that dive deeper into Drupal’s position in relation to other projects, most notably Wordpress. I would recommend watching WordPress vs Drupal: How the website industry is evolving and What's possible with WordPress 5.0 for more information on this topic. 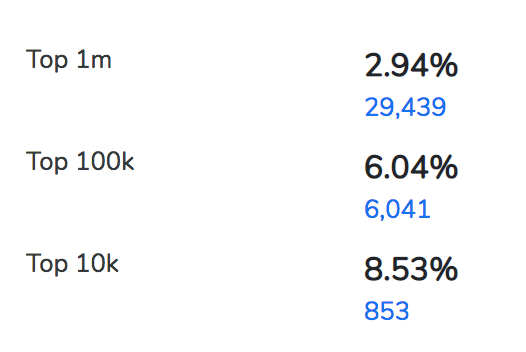 According to builtwith.com, Drupal still has a sizable chunk of Alexa’s Top Million Sites. 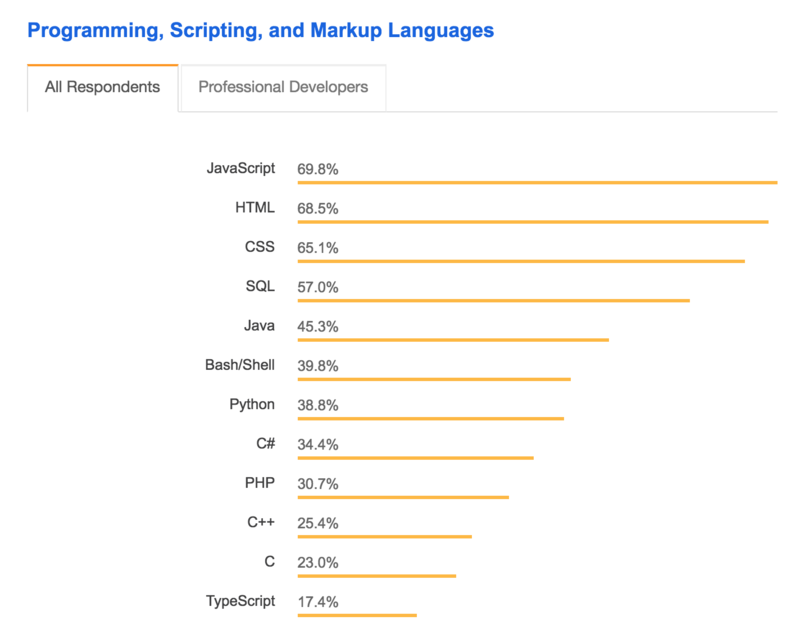 It should also be noted that Drupal does better the higher you go up the list of those sites which underscores the project’s focus on the enterprise. With the release of Drupal 8, Drupal’s target audience started consolidating more towards the enterprise user. In the future Drupal’s success as a project will be tied more closely to performance against platforms like Adobe CMS and Sitecore in the marketplace. A big issue that needed to be solved with these frameworks was how to address SEO. Initially, these frameworks only rendered the page in the browser which meant site content was largely hidden from search engines. For SPA’s this was not necessarily a deal breaker but this limited the broader adoption of this technology. Only fairly recently have we seen solutions that are able to use the same framework to serve pages both in the browser and on the server. Why do I bring this up? Because this has been one of the more difficult challenges and React.js addresses it better than any other framework. 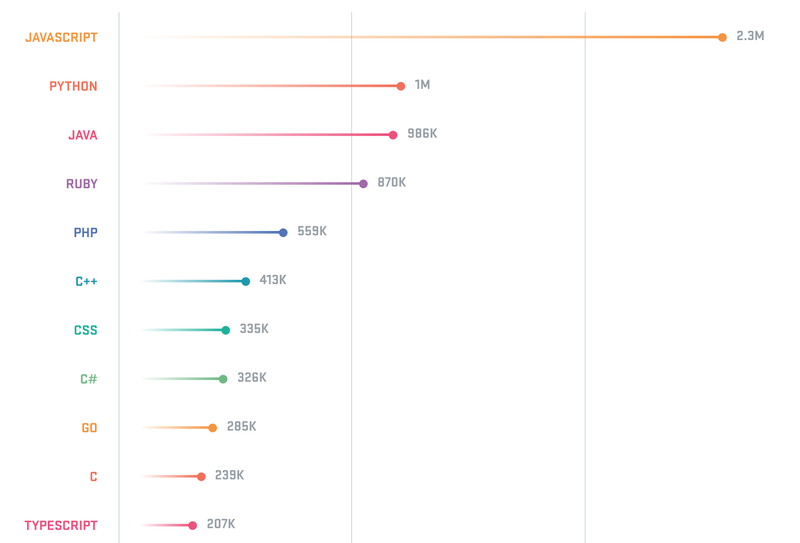 There are many reasons why React.js adoption is exploding but this is why I believe React is king. Is React compatible with CMSs of ‘ole (e.g. Wordpress, Drupal, etc.)? Well, yes and no. You can integrate React.js with a Drupal or Wordpress theme like you can many other technologies. In fact, it’s very likely that Drupal’s admin interface will run on React at some point in the future. There is already an effort underway by core maintainers to do so. Whether or not the admin will be fully decoupled is an open question. Another example of React admin integration is none other than Wordpress’ implementation of React.js to create the much anticipated Gutenberg WYSIWYG editor. The real power of React is when you can combine it with GraphQL, React router and other pieces to create a highly performant, interactive experience that users will demand in years to come. To accomplish this type of app-like experience, developers are increasingly looking to API’s to address this dilemma, which we will examine next. The last couple of years there have been many Cloud CMS-as-an-API services pop up that have been generating some attention (Contentful might be the most popular). 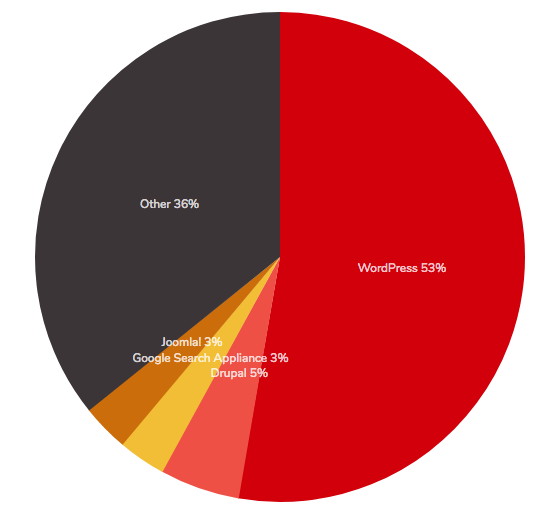 At this time it doesn’t appear that these API’s have disrupted market share for Wordpress & Drupal but they do signify a movement towards the idea of using a CMS as a content service. The “Decoupled” movement in the Drupal community (previously known as “Headless”) has been a big topic of conversation for a couple of years now. 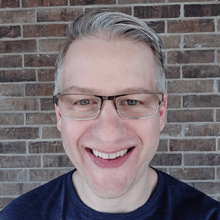 Mediacurrent’s own Matt Davis has helped organize two “Decoupled Days” events to help the Drupal community consolidate ideas and approaches. Projects like Contenta CMS have helped advance solutions around a decoupled architecture. Dries has also addressed Drupal’s progress towards an “API-first” approach recently on his blog. While cloud services like Contentful are intriguing there is still no better content modeling tool than Drupal. Additionally, Drupal 8 is already well underway to support JSON API and GraphQL, with the potential to move those modules into core in the near future. Next, we will look at a relatively new entrant to the family, JAM stacks, and see where they fit in with Drupal (if at all?) in the future. JAMStacks - The Silver Bullet? The popularity of Netlify hosting and static generators has created some buzz in the Drupal community, particularly Gatsby.js, which we will examine in a moment. Netlify provides some great tooling for static hosted sites and even offers its own cloud CMS. Mediacurrent actually hosts our own website (Mediacurrent.com) on Netlify. Mediacurrent.com runs on Jekyll which integrates with a Drupal 8 backend so we are well aware of some of the benefits and drawbacks of running a static site. Since then Gatsby.js has risen dramatically in popularity and has a robust source plugin system that enables it to be used as a Frontend for many platforms including Drupal and Wordpress. The creator of Gatsby, former Drupal developer Kyle Matthews recently spoke on the subject at Decoupled Days 2018. While it’s hard to know if JAM stacks like Gatsby having staying power in the years ahead they do have a lot of appeal in that they simplify many of the decoupled “hard problems” developers commonly run into. The question of scalability is an important one yet to be answered completely but the upside is tremendous. In a nutshell, Gatsby provides an amazingly performant, React/GraphQL solution that can pull in content from practically any source (including Drupal). Do JAM stacks like Gatsby have staying power? Will these close the complexity gap that blocks more sites (large or not) from decoupling? We will have to stay tuned but the possibilities are intriguing. We have examined the state of Drupal as a project, future release plans and how it is adapting towards a future that is “API First” that also fits well with the React world in which we now live. The main takeaway I would offer here is that Drupal, while still an amazing tool for managing content, is better suited as a technology paired with a leading Frontend like React. With the web evolving from monolithic systems to more of a services-type approach, it makes sense to use a best-in-class content modeling tool like Drupal with a best-in-class FE framework like React.js. For organizations evaluating Drupal, I do think the “Decoupled” approach should be strongly considered when planning your next redesign or build. That being said, it’s important to have an understanding of how the pieces fit together as well as the challenges and risk to any approach. This article attempts to present a high-level overview of the technology landscape and where it’s headed but every organization’s needs are unique. At Mediacurrent we work with clients to educate them on the best solution for their organization. Have questions or feedback? Hit me up at https://twitter.com/drupalninja/.